You never know when an accident will happen, know how to react in an emergency is very important. 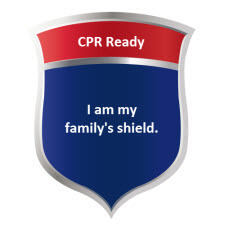 Several years back when I was attending college I had to take CPR at the time it really felt like a had to, but when my children came along I knew there was nothing more important I could know! While thank goodness I have never had to give mouth to mouth I have faced a few choking emergencies that my training came in handy for. ACLS National, a medical certification company offering a free CPR campaign to improve awareness and knowledge of general lifesaving skills like rescue breathing and chest compressions. Through just six easy steps you can learn how to provide CPR to an adult, child, and infant. While nothing can prepare you for the emergency situations you may face in 15 short minutes you can have a better understanding of how to save a life. To become your family shield click the picture or any of the links within the post.